This page contains a listing of Addons, Utilities, and other applications that can integrate with Bugzilla. If you know of something that's not listed here, feel free to add it (this is a wiki after all). If it doesn't fit in one of the existing categories, feel free to add a new category. Remember, nothing listed here is officially recommended by the Bugzilla Team (nor are they necessarily not recommended), so use these at your own risk. This is just a collection of things we know about or that people have told us about or posted here. TaskCompiler (website) - TaskCompiler is a bug tracking aggregator software that includes rich editing and querying for Bugzilla issues. As a Bugzilla desktop client, TaskCompiler enables the user to search and edit or create Bugzilla bug or task tickets, in both offline and online modes. As an Agile development tool, TaskCompiler's main focus is on ease of use and speed of execution. TaskCompiler also includes the TeamServer addon, which enables you to add private comments to your tickets, which are visible to your programmers only. qTrace (website) - qTrace is a test and defect documentation tool which automatically captures every screen and step of a defect or test case and seamlessly integrates with leading bug trackers including Bugzilla. You can use qTrace for free or upgrade to the Pro edition with more functionality. BugCam (website) - BugCam is a video recording tool for software developers and testers that integrates directly with Bugzilla. Bugcam makes it easier to document and reproduce complicated bugs. Bug videos created with Bugcam can can also incorporate your voice, so you can explain what you're doing as your screen is being recorded. Bugcam is completely free for casual use (up to five bug videos per month). Bug Shooting (website) - Bug Shooting is a screen capture utility for software developers who uses Bugzilla. Bug Shooting provides an easy way to create screen captures and attach them to Bugzilla bugs, e.g. in order to report a bug or to explain an improvement suggestion visually. Entomologist (website) - Entomologist is an open source desktop tool for working with Bugzilla bugs across multiple trackers. ALM Works Deskzilla (website) - Deskzilla provides the user with an Outlook-style rich interface to your Bugzilla. It is a desktop client that allows you to search and make modifications to bugs even when working offline (offline changes are synchronized later with possible field-by-field conflict resolution). There are features that facilitate planning and managing projects, like nested queries, by-field distributions, arranging bugs in a hierarchy, query counters that immediately show the number of bugs satisfying a query. For Agile development, Deskzilla can be used to maintain backlog order by using a custom field to hold order value. Deskzilla also comes with a bundled screenshot capture & edit tool and integrates with IntelliJ IDEA and Visual Studio IDEs. Tasktop (website) - Tasktop is a desktop client that includes rich editing and querying for Bugzilla tasks based on Eclipse Mylyn. Tasktop supports offline reading and editing as well as task change notifications so there's no need to receive emails from Bugzilla. Tasktop also includes advanced time tracking and reporting facilities, great for determining what tasks and projects you have been spending time on, helping to hone estimates, and complete time sheets. Tasktop also includes facilities for scheduling your tasks whether they are from Bugzilla, another supported repository, or your personal tasks. Integration with your web browser, Google or Outlook calendar and Google or Outlook email allow you to organize your entire work day. Splatter (website) - Splatter is an open source bugzilla client for the Gnome desktop. You can create multiple complex queries across multiple bugzilla installations, and view/comment on any bug. It features an unread-comment notification system, sits in the system tray and shows libnotify popups when changes are incoming. Currently in early stage of development. MyZilla (website) - MyZilla is a free desktop client for Bugzilla that runs on Windows. It increases the productivity of Bugzilla users through the speed of a desktop tool. Multiple accounts, convenient shortcuts, bulk operations, query management are just some of the features MyZilla offers. Bugxula (website) - Bugxula is an extension for Firefox/Mozilla/Netscape that provides a GUI interface to several features in Bugzilla. Note: no longer maintained and only works with Firefox 1.0 to 1.5. BugMon (website) - BugMon is a desktop Yahoo!/Konfabulator Widget designed to give you a continually updated view of a Bugzilla Project. In addition, it can serve as a simple Bugzilla front-end, by allowing you to create new bugs and jump to individual bugs for editing purposes. Supports sorting, scrolling, color-coding, custom query strings, and more! LiveProject (website) - LiveProject is an application made by KaDonk. It runs on windows XP, and monitors bugzilla databases "live." Users can monitor any number of databases using regular bugzilla search filters. Bugs are color coded, and provides a quick launch pad for launching bugzilla in your browser "at the right bug". LiveProject requires Bugzilla version 2.18.1 or later. LiveProject also is a free Microsoft Project Viewer. LiveProject is free for everyone. BugSplat Crash Reporting (website) - BugSplat is a software crash reporting tool used by developers to track and report user crashes across C++, .Net, Java, and OS X applications. BugSplat's integration with Bugzilla allows your team to create defects with a single button click. Hyperlinks allow quick navigation from defects to crash reports and back. Defects created from BugSplat automatically include symbolic call stack information as well as other crash-specific data that can help your team fix bugs more efficiently. Bugzilla Time Tracker (FireFox extension) - Allows you to track all your working time spent in Bugzilla. Perfect for everyone who works a lot with Bugzilla and want to measure their time spent on bugtracking. view bug attachment source (website) - Greasemonkey script for Firefox adds a "source" link next to the mime type of attachments, except for text/plain attachments such as patches, allowing you to view the source of an attachment that would otherwise crash Firefox when viewed normally (such as testcases). Jesse Ruderman's Bugzilla Bookmarklets (website) - bookmarklets for multiple browsers to make using Bugzilla or Bugzilla-related data easier. Igzilla (website) - Google homepage gadget to list bugs from your favorite Bugzilla instances to your personalized homepage. BuggyBar (FireFox extension) - Allows you to interact with bugzilla in an easy chrome sidebar. Interclue (Firefox extension) - has customized link previews for bugzilla tickets (and also trac trickets). Great for looking through timelines and ticket lists as it will automatically pre-cache the next and previous link in the list (without pre-caching every link on the page). Interdiff Link - Greasemonkey script that adds a "diff against previous patch" link to attachments that are patches. Bugs Dashboard - (browser based) - Test any of dozens of versions of Bugzilla (MySQL, PostgreSQL, Oracle from v3.0 to 3.6rc1). Portal dashboards with over 30 portlets for reporting and visualizing bugs. Extend it by creating your own plugins. Drag-and-drop priorities and severities. Many community, open source, portlets available. Graphical interface for managing widgets and dashboards. TidyBug (Greasemonkey script) - Hides useless/empty fields and adds keyboard shortcuts. bzhome - (browser based) - Allows you to view all recent comments on bugs you're watching in a single, integrated dashboard. Bugmail An update which works on current versions, of Bugmail - Thunderbird add-on that adds bug status to the mail preview header pane. User:Clarkbw/Bugzilla_Link_Grabber_Extension - Thunderbird add-on that nicely formats bugzilla links inline in messages. Mabugs (website): Maemo-based Bugzilla client for Nokia Internet tablets. ZeeBugs: is a Bugzilla iPhone App. With ZeeBugs you can access multiple Bugzilla servers, search for words in bug summary or description, comment on existing bugs, modify some fields, and resolve Open bugs. ZeeBugs works with Bugzilla versions 2.2 and above. Not available in the US store. bugzilla-mobile A mobile friendly web client for Bugzilla. Scrapes Bugzilla UI. BugTender A mobile friendly web client for Bugzilla. Uses JSON-RPC interface. Tasktop Pro and Starter (website) - Tasktop Pro is a suite of Eclipse plugins (also available as a desktop client) based on Eclipse Mylyn that provide rich editing and querying for Bugzilla tasks, offline reading and editing as well as task change notifications so there's no need to receive emails from Bugzilla. Tasktop Pro also provides a number of enhancements including email and calendar integration along with time tracking and reporting, great for determining what tasks and projects you have been spending time on, helping to hone estimates, and complete time sheets. Tasktop Starter (free) is a suite of Eclipse plugins that includes the Bugzilla integration while offering a subset of the Tasktop Pro features including Time Tracking dashboard and Gmail/IMAP integration allowing you to easily create tasks in your Mylyn Task List from your Gmail or IMAP client. Mylyn Bugzilla Connector (website): a full-featured client for Bugzilla that supports offline editing and change notifications. The client can be integrated into the Eclipse IDE or as a standalone application. Eclipse Bugzilla (website) - This plug-in integrates Bugzilla bug tracking into the Eclipse workbench. The approach for integration is a light-weight one, the web interface is used to handle common tasks and provide easier access using an Eclipse UI. The web interface is integrated in Eclipse via the SWT browser widget. TrackLink (website): a plug-in for IntelliJ IDEA that loads Bugzilla bugs through Deskzilla desktop client. Besides showing results of selected Deskzilla filters, the plug-in is able to detect Java stack traces in an issue and apply IDEA's "Analyze Stacktrace" action to them. bugzilla-intellij-task-provider (website): an open-source plugin for IntelliJ IDEA Ultimate. Allows you to view your list of bugs within the task management portion of IntelliJ. You can submit bugs here. Bugzilla Linker (website) - script plugin for the Colloquy IRC client (for Mac OS X) to link bug numbers mentioned in IRC channels and open Bugzilla bugs from the input line. JujunieIntegration (Freshmeat project page) One of the integration modules in this application updates a Imendio Planner file with the time tracking information held by Bugzilla. It also updates the bugs deadline according to the project plan, and generates a mail report with a set of warnings highlighting inconsistencies between the Planner file and Bugzilla. TaskJuggler (website) TaskJuggler is an Open Source tools for serious project managers. See TaskJugglerIntegration for scripts that create input files from Bugzilla for a TaskJuggler project. 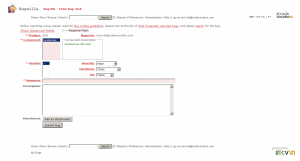 Projzilla (website) Projzilla allows you to create Microsoft Project files from Bugzilla. This enables users to quickly generate Project files and help Project Managers evaluate the state of their projects. git-send-bugzilla (website) git-send-bugzilla is a utility to upload a changeset from your git client workspace as a patch to a Bugzilla bug. BZ::Client is a Perl module, which provides a client side API, which is relatively close the the server side API. Bugzproxy is a C# based assembly that provides an OO client side API. It can be used to build commandline tools, VS 2005 integration, etc. Works with Linux/Mono. bztools is a python library to interface with the Bugzilla REST API via python, with all the pythonic behavior you would expect. See this blog post and the README for more info. Bugzilla Kanban is a php/js based front end client for Bugzilla using the XMLRPC API. It displays items on a Kanban board where they can be created, viewed, sorted and updated. It is self-contained, and can connect to any local or remote Bugzilla server. Mozilla wrote some scripts to move components from one product to another, and sync flags, milestones and versions between products. They were last used on Bugzilla 3.2 and come with no warranty, but may be useful starting points if you need to do the same thing. You can find them here (check out the bmo-4.0 repo from bzr). BzAPI - A REST API proxy for Bugzilla, retro-fitting a RESTful API to your Bugzilla installation, with JSON output. This makes it much easier for you to build your own Bugzilla-data-consuming applications or web pages. Mediawiki Extension This extension checks your Bugzilla installation and adds a strikethrough to interwiki links for closed bugs. Bugzilla Reports MediaWiki Extension (website) - Generates great looking sliced and diced reports from your Bugzilla instance which you can embed in your MediaWiki pages or any PHP application. Makes reporting on your bugs much easier than through the standard Bugzilla search UI. Zimbra (website) - Zimbra (an email/groupware product) has a Bugzilla Zimlet which will show bug information and hyperlink to Bugzilla when bug numbers are mentioned in their webmail app. Apache HTTPD - mod_authn_bugzilla is an Authentication module for the Apache HTTPD, that allows to use the Bugzilla database as an authentication server. There's also a patch available, which allows to use and manage the Profiles.extern_id field as a "User ID" (as opposed to Bugzilla's login_name, aka email address). Together, these tools allow, for example, to have your SVN, WebDAV, or whatever users be managed by Bugzilla. Rally Agile Lifecycle Management (website) - project and program management with requirements management and executive–level reporting, with connectors to several commonly used tools, including Bugzilla. Liaison - Collaboration for developers and complete development teams. An approach to integrate bugtracker (Bugzilla), Wiki (MoinMoin), subversion and other tools. Inspired by trac. Bonsai - Web-based tool for managing CVS, the Concurrent Versioning System. Using Bonsai, administrators can control open/closed status of trees, query a fast relational database back-end for change, branch, and comment information, and view changes made since the last time the tree was closed. Bonsai also integrates with Tinderbox, the Mozilla automated build management system. Tinderbox - Continuous-build system which can integrate with Bugzilla. CogniDox - The CogniDox document management system has a plugin for linking Bugzilla 4.x bugs to managed documents. The plugin allows users to quickly see if a document has any associated bugs; easily hyperlink to bugs in document comments and reviews; track the number of open bugs across documents in projects and locations; find all the documents within a project or location with open bugs and show related and affected documents directly in the Bugzilla bug view. See the "VCS" extension the #Bugzilla_Extensions section. SCM-Manager Universe (website) - SCM-Manager is the easiest way to share and manage your Git, Mercurial and Subversion repositories over http. The free virtual appliance SCM-Manager Universe is a Linux based virtual machine, which integrates source code management, bugtracking with Bugzilla and continuous integration in one completely preconfigured system. svn.it-projects.com (website) - it-projects.com integrates Bugzilla with Testopia and Subversion and offers reliable services for developers as a hosted solution. p4dti (website) - The Perforce Defect Tracking Integration (P4DTI) connects your defect tracking system to Perforce, so that you don't have to switch between them and enter duplicate information about your work. It also links changes made in Perforce with defect tracker issues, making it easy to find out why a change was made, find the work that was done to resolve an issue, or generate reports relating issues to files or codelines. SCMBug (website) - Scmbug is a system that integrates software configuration management (SCM) with bug-tracking. It aims to be a universal tool that will glue any source code version control system (such as CVS, Subversion, and Arch) with any bug-tracking system (such as Bugzilla and Mantis). CVSZilla (website) - CVSZilla is a small piece of Perl-glue to integrate CVS, Bugzilla and CVSWeb or ViewCVS with each other. CVS to Bugzilla integration - A detailed description of an email solution to integrate cvs and webcvs into Bugzilla without patching either Bugzilla, cvs or webcvs. svn_bz (Svn repo) - Simple script (based on Sean Foy's earlier work) to append Subversion commit messages (author, revision, changed files, and description) to bugs that are referenced in the commit description text. Designed to be used where Bugzilla and Svn are on the same server. svn_bz_email_in (perl script) is a modification of this to use the Bugzilla email in feature (2.23.3+ Bug 353994). It uses Bugzilla's inbound email interface to actually parse the commit message, so the message can contain anything that the email interface supports. AccuBridge (website) - Bidirectional integration with the AccuRev SCM suite. GitZilla (website) - Python based easy to use Git-Bugzilla integration GitZilla-GitHub (Git repo). Supports multiple bug references in commit messages. Support for checking bug statuses before allowing commits. Provides the update hook (for allowing/rejecting commits) and the post-receive hook (for adding comments to Bugzilla). Supports per-user auth credentials when pushes are done via ssh. Allows custom bug id capturing regexes. Allows customization of bugzilla comments formed from commit messages. Simple configuration requires using supplied hook scripts with a 4 line config. And this includes all of the above - driven by a config file. Also makes it possible to write custom hooks which do more than just integrate with Bugzilla by providing (Python) functions which handle all the Bugzilla integration. March Hare Software (website) - Bidirectional integration with the CVSNT and CVS Suite change management system. check bug statuses before allowing commits. check bug assignee before allowing commits. Burtle (website) - Integration with the tortoise source control client and bugzilla using the xml-rpc set of APIs. Secured storage of the bugzilla login details. Selected bugs will be inserted into the commit message. Modified bugs will be modified when the commit completes. PractiTest - PractiTest is a lightweight SaaS QA & Test Management solution, enables to organize tests, runs, and requirements. PractiTest is two-way integrated with Bugzilla, enabling users to see the traceability in one place. Read more about PractiTest in Wikipedia. TestLodge - Online test case management tool, allowing you to manage your test plans, test cases and test runs with ease. Klaros-Testmanagement - Klaros-Testmanagement is an Ajax based web application for organizing and managing the test process in software development projects. A free and unlimited Community Edition is available, that integrates with Bugzilla. Gurock TestRail - TestRail is a comprehensive web-based test case management software to efficiently manage, track and organize software testing efforts. TestRail can be integrated with Bugzilla by linking test results to bug entries. Nuevosoft Test Manager - Nuevosoft Test Manager is a fully web based, comprehensive and easy to use test management tool. It integrates with bugzilla for showing intuitive dashboards. The tool provides full traceability between requirement/feature to testcase design to test case execution and to a bug report that is stored in bugzilla or other bug management system. Salome TMF - a test management framework, with Buzilla Plugin. Salomé-TMF offers features for creating and executing tests. We use the concept of tests defined in the norm ISO9646. Tests can be manual or automatic, tests are organized in campaigns and are executed with different datasets in different environments. For making test execution fully automatic, we integrate a script language based on Java in our tool, as one of several plugins which extend Salomé-TMF functionalities. Looks like that V3 does not support anymore Bugzilla Plugin. QMetry (website) - QMetry is a comprehensive Test Management Platform equipped with Bugzilla integration. QMetry's Metric-Rich Dashboard enables real time views into the quality of your software application. Testopia (website) - a web-based test case management system that works as an add-on to Bugzilla. SpiraTest (website) - an integrated Requirements Management and Test Case Management suite that has the ability to log bugs during a test run and synchronize them with an instance of Bugzilla. Tested against Bugzilla v3.0. Testuff - software as a service (SaaS) test management that (amongst other things) records a video of the tested application and attaches it to the bug reports. Testuff integrates with Bugzilla. 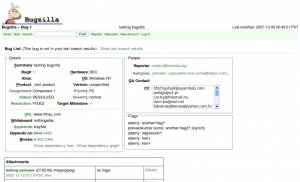 TestLink (website) - a web-based open source test management and execution system that integrates with Bugzilla. These are server-side Bugzilla Extensions that can be installed in the "extensions/" directory of Bugzilla 3.6 and above. New extensions also are published from time to time in the Bugzilla git repo. This list should be kept in alphabetical order. BrowserID Allows logging in to Bugzilla using BrowserID. Env4AD This Bugzilla extension provides a new auth_login_method that extends the default Bugzilla::Auth::Login::Env. It is especially useful if you want single sign on using mod_kerb and Active Directory but your ADs userPrincipleName is not a valid email address. It also sets a proper full name. FieldGroups adds optgroup ability to bug fields. InlineImages Allows users to see images in line but does not load them on the page by default. Lets users have a quick way to see images if they want without making the page load any slower for those who are less graphically inclined. InlineHistory Shows bug activity on the main show_bug page. MultipleEditNoEmail Provides a checkbox to not send email when changing multiple bugs at once, disregarding user preferences, user watching and global watchers. To be used for miscellaneous bug updates. NextBug Adds a link that recommends similar bugs based on the textual description of the bugs stored in Bugzilla. It uses an AJAX event and, thus, it will not cause any additional overhead if it is not explicity called. Profanivore Eats profanities in bug comments and replaces them with Profanivore droppings ("****"). Push Enables integration with a message broker (such as RabbitMQ, ApacheMQ, HornetQ, Qpid, Redhat MRG, etc) via AMQP or STOMP. This allows tools and users to be notified of bugzilla changes without polling. Securemail Enables encrypted email for some (group-based) or all bugmail. Users can specify their own S/MIME or GPG key. Sitemap Allows Bugzilla to be indexed by Google and other search engines. Splinter Adds the ability to perform patch review on Bugzilla attachments. When a user uploads a patch to a bug, a link will appear next to the attachment to allow the reviewer to comment on the patch that's then added to the bug report. Also a reviewer can set a review flag from within the Splinter extension. The 4.0 version of the Splinter extension has also been tested to work well on 3.6 as well. If any changes are made that make this no longer true, a separate 3.6 repository will be created. Sync Provides infrastructure for asynchronous synchronization of Bugzilla bugs with matching bugs in another defect tracking system. You have to write a "plugin" to customize it for the system you are specifically trying to integrate with. TraceParser Parses stack traces that are pasted into comments, formats them nicely when comments are displayed, automatically detects duplicate traces when filing bugs, allows finding traces similar to the one you're viewing, and shows most-frequently-reported traces. VCS Version Control Integration for Bugzilla! Allows associating bugs with commits in your version-control system (sometimes also called an "SCM" or "Software Configuration Management" system), and displaying information about those commits on the bug view page, with a link to see more details about the commits directly from your version control system. supybot Bugzilla plugin - This plugin for supybot can query, report changes for, and describe attachments and bugs in multiple different Bugzilla installations. It even works across multiple IRC networks. It is highly configurable on a per-channel basis, and was originally written by one of the primary authors of Bugzilla itself. It is currently being used by GNOME and the Bugzilla project itself. Plugin is available at git.mozilla.org bugbot repo. BZBot (direct download) - announce bug changes and perform simple milestone-based status mini-reports. MozBot (web site) - MozBot is a general-purpose IRC bot with lots of addon modules. It ships with a module for Bugzilla that lets you perform queries against your Bugzilla and also can announce bug changes. On irc.mozilla.org we no longer use bzbot, because this module can do most of what he used to do, but if all you want is bug change announcements, MozBot might be overkill. Note: The tarballs of MozBot on the FTP server as of this writing are VERY outdated, and do not contain a working Bugzilla module. You must check MozBot out of the Mozilla CVS repository to get a working Bugzilla module. ChangelogGenerator (web site) - tool for generating changelogs from a bugzilla database based on the target milestone. It's completely written with C# and the Microsoft .NET Framework 3.5. Bugzilla Changelog (web site) - generates changelogs for a product based on bugs resolved fixed against a specific target milestone. BugzillaMetrics (web site) - enables the evaluation of a wide range of process metrics from the Bugzilla database. JujunieIntegration (website) One of the integration modules in this application generates a report based on time tracking information in Bugzilla, allowing you to know the time spent by a set of users in a range of time, summarizing the hours worked by users and by days. Dashboards (website) - Desktop based Bugzilla Dashboards. You can connect to your Bugzilla database and run the pre-canned Dashboard queries. 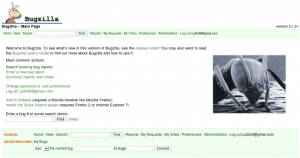 Bugzilla Printable Reports This is a open source PHP script that shows bugs in a printer friendly format. Comes with a simple form to filter a bug search. bzquips (Svn repo) - Some computer-science related quips that I liked, and added to one site's Bugzilla installation. Warning: light profanity in klortho's quotes. Media:BugzillaSkin_codevocation.tar - Skin for Bugzilla 4.2.2. White and clear layout. Metro UI style home buttons. Virtual Bugzilla 3.4 (website) - Free VMWare virtual appliance with pre-installed Bugzilla 3.4.4 and seven localization packs. You can run it on Windows or Linux with a VMWare Player (also free) to get a working Bugzilla in 5 minutes after download. Download size: 57 MB. SCM-Manager Universe (website) - SCM-Manager is the easiest way to share and manage your Git, Mercurial and Subversion repositories over http. The free virtual appliance SCM-Manager Universe is a Linux based virtual machine, which integrates source code management, bugtracking with Bugzilla and continuous integration in one completely preconfigured system. It has a comprehensive documentation, including tutorials, a sample project and tool descriptions. All of the software development tools authenticate against a central LDAP server with reasonable default users and groups configuration. The appliance has also a simple backup mechanism, which allows regular backups of all relevant files.. Download size: 1,5 GB.